1. With a food processor or blender, blitz all ingredients for the tea soup and season with salt to taste. Set aside. 2. Heat a little olive oil in pan and saute 1 portion of garlic till fragrant. Stir fry chye sim and set aside. Repeat with the spinach, long beans and cabbage separately. 3. Pan-fry the ikan bilis with a little oil till golden brown and crispy. Alternatively, you can also toast them in the oven with no oil. Do the same for the tau kwa and dried shrimps separately. Set aside. 4. 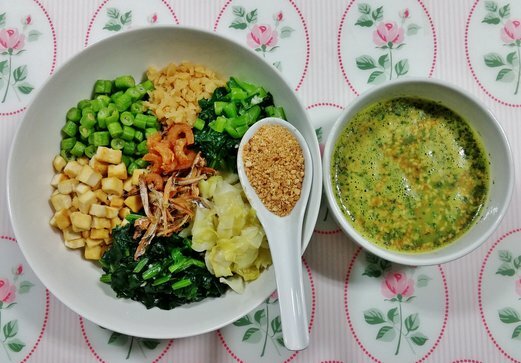 To assemble the thunder tea rice, scoop some brown rice into a wide bowl and arrange the rest of the ingredients on top together with 1 tbsp of ground peanuts. 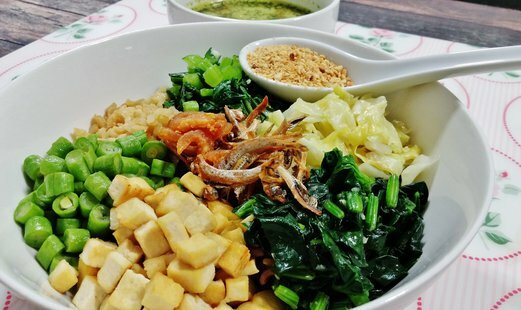 Serve the tea soup separately or pour into the rice, mix thoroughly and enjoy. If you find the tea soup too thick for your liking, you can adjust it by diluting with hot water or homemade (either non-salted or low-sodium) vegetable broth. For vegetarians, just skip the anchovies and dried shrimps 🙂 This is one of my best ways to eat vegetables. A very filling meal yet not heavy on the stomach. Bon appetit! Thanks for visiting my blog! I’m a huge fan of Singaporean/Malaysian/Thai/Chinese/Korean food, and would like to follow your blog and read about your yummy adventures! I’m wondering how I can do that via wordpress since I don’t see a button for that. Can you help me figure out this blogging blip so I can follow you in turn? Wow! Very nice Geri! I would never have thought of making my own Lei Cha Fan! hehe..
Wow Geri! I’ve never seen anything like this before – it looks amazing! I think I’ll have to do some substituting when I give this one a try as I’m afraid I won’t be able to find some of these ingredients…but it sounds really really good! Thanks Geri! I’ll let you know when I try it!